Will Cavallo anxiously paced while his teammates formed two lines before Sunday’s men’s soccer season finale against St. Francis (N.Y.). Alongside him to celebrate Senior Day were his parents, his aunt and his girlfriend. As he walked toward the center of the field to receive his plaque and a poster to commemorate his service to the team, there were only smiles. In the back of Cavallo’s mind, though, he knew that just two years ago this may have been no more than a dream. When Cavallo was 4, he began playing recreational soccer after his mother pushed him to become active. At that point, he figured success in the sport was not exactly in his future. Nonetheless, the Londonderry, N.H. native continued to pursue soccer. After playing on travel squads ranging from the New Hampshire Classics to the New Hampshire Storm, he settled down and played high school ball at Londonderry High School. When it came time to prepare for college, Cavallo had a dilemma in front of him. After sending his highlight tape to some local Division III colleges, he was put on the waiting list for Quinnipiac. “At that point, I decided I wanted to get into a good school, focus on getting a good education,” he said. 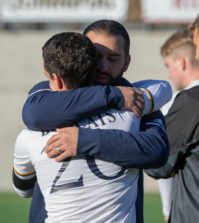 In the summer following his senior year of high school, Cavallo was told about a camp run by Da Costa that would allow him to display his skills. From his home in Londonderry, Cavallo drove three hours to and from Quinnipiac for an entire week. Unfortunately, Cavallo said things didn’t go according to plan. “I played terribly, and coach told me he didn’t have a spot for me on the preseason roster,” Cavallo said. Still, he was not deterred. 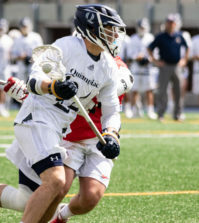 After practicing once more in front of the coaching staff, Cavallo was invited to participate in team activities in the spring of his freshman year. He was initially told that he would not have a spot on the team due to a full roster. But one of the seniors on the squad unexpectedly left, allowing him to join. He impressed that season, and was invited to be a full-time member of the team shortly thereafter during his sophomore year. Upon making the team, though, Cavallo was asked to make a position switch for the first time in his life. After playing in only three games his sophomore year, Cavallo asked if he could switch to being a midfielder or a forward. Following the change, he started 14 games for Quinnipiac during the 2010 season, and played in 16. In the process, he registered three goals alongside one assist, and established himself as a presence for the Bobcats. Cavallo and his coach began to develop a strong relationship. Cavallo remembers being intimidated at first, but says things changed. With a stronger bond in mind, Da Costa asked Cavallo to revert back to being a defender for his senior year. Though a little hesitant at first, he ultimately decided he’d do what was best for the team. He also believes it helped him become a better player. It also provided for one of the biggest moments of his collegiate career. 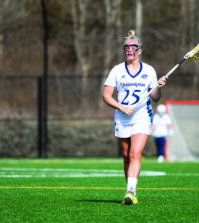 On Sept. 24 against Loyola, Cavallo’s career seemingly came full circle. Two years after shedding his scoring desires to focus on becoming a defender just to walk on the team, he buried his first and only career goal at the position. 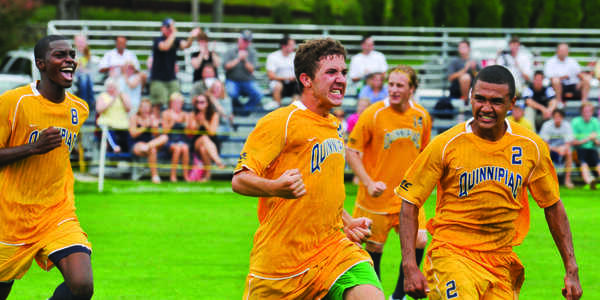 The score also proved to be the game-winner, as his strike in the 54th minute propelled Quinnipiac to a 1-0 victory. The victory was one of six wins this season for the Bobcats, who finished 6-10 overall and missed the NEC playoffs. Despite not reaching the playoffs, Cavallo said that it did not deter him from enjoying his time with his teammates. 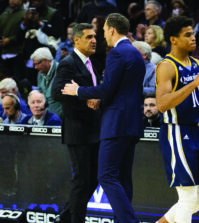 Although Cavallo is eligible to return to play next season since he did not walk-on until his sophomore year, he is still unsure of his future plans. Much like how he decided to focus on his schoolwork before deciding on a college, Cavallo may expand his education. While he is a broadcast journalism major, he says that he may attend graduate school to expand his talents in the advertising field. “I like telling stories. I like being creative, and I think that goes a long way for me,” Cavallo said. Fresh off the completion of his senior season, Cavallo looks back on his collegiate career and attributes his persistence to get on the team to the person that made him play soccer in the first place at age 4: his mother Susan. With that attitude in mind, he fully acknowledged that this mentality paid off for him in a game against No. 12 Boston College during his junior year. From being wait-listed at Quinnipiac to scoring a game-winning goal in what may be his swan-song season, Cavallo serves as a prime example of just one of Quinnipiac’s many hidden gems. Upon receiving his diploma at graduation this May, Cavallo knows he will have no regrets about how things turned out.